Asian Yoga Holidays collaborates with a small select group of experienced and highly qualified teachers that live what they teach and thus can efficiently help you transform in any way you desire. First and foremost, teaching yoga is a vocation, and all teachers endorsed by us incorporate this primary tenet in their own personal way. The way they live is what they want to share with you. Andrew was first inspired by the wisdom traditions of Asia during his years at university, where he majored in East Asian Studies. After graduating in 2001, he set off to travel and see the world, and ended up spending the better part of a decade studying with teachers of the physical and subtle arts, all across the globe. Andrew is incredibly grateful to all his teachers, and to all the lineages of teaching which he has had the good fortune to come across in his studies. In particular, he cherishes his time spent in Beijing, China, where he studied intensively with taijiquan and qigong masters Wang Hong Er and Sebastian Lee, as well as his live-in apprenticeship to the late ninja master, Dr. Glenn J. Morris. Andrew's relationship to Yoga was transformed in 2004, when he began studying a unique style of Hatha- and Kundalini-Yoga in Miami with Santiago Dobles and Tao Semko, based on a system developed by a Romanian lineage of yogis. Andrew continued to absorb these teachings under the tutelage of Swami Vivekananda Saraswati at Agama Yoga in southern Thailand, where he lived for several years as both a student and teacher. After years of direct investigation into the nature and meaning of the human experience, Andrew returned to the academic world to earn a Master's degree in psychology. This time spent re-immersed in formal education helped him to better understand the experiences that came about as a result of his yogic practice, and gave him a stronger framework with which to understand and guide other practitioners' development. Now, when teaching, Andrew strives to incorporate both conceptual and hands-on learning for his students, with the intent to foster an ongoing discovery of the deeper and subtler layers of self, consciousness, and acute presence. An accomplished cross-country skier in his youth, Swiss Virgo Julien came upon the spiritual path in early 2002 after lots of adventure in his early 20s. He traveled extensively throughout Central and South America while enrolled in university, and spent a good amount of his time exploring our amazing planet, immersing himself in unknown cultures and meeting its peoples and ways of lives. In February 2001, a life-changing and near-fatal accident on a small paradise island in Brazil kindled his interest in the mysteries and spiritual traditions of the East. He soon embarked on his first trip to Asia, where he did his first meditation retreat at a Thai forest monastery. A few months later Julien found himself in Swami Vivekananda Saraswati's First Level Intensive Course at Agama Yoga in Rishikesh, which radically revolutionized his outlook on life. The Truths set forth by this passionate teacher deeply touched him, and a feeling that "this was it" began to unfold. However, he did not drop out all at once. He returned to Switzerland for another year to earn his Masters degree in Finance & Economics from the University of St. Gallen (HSG). He wrote his master's thesis on the dollarization of developing countries with special reference to latin-american experience, and was awarded a prize for the best thesis of the year. In early 2004, Julien moved to tropical Koh Phangan, Thailand, and committed himself fully to his yoga practice and a continuous striving for yogic realization. He also became a filmmaker, producing and co-directing Through the Eastern Gate, a poetic documentary about three young Westerners searching for meaning in modern times; the film has screened in 11 film festivals on 4 continents, and was picked up by Alive Mind Media/Lorber HT Digital for DVD distribution in late 2008. In 2008, Julien conceived and initiated the Phangan Film Festival (PFF) – an annual open-air event bringing high-quality independent films from around the world to the beautiful island of Phangan. Following PFF's success, Julien co-created the annual Dharamsala Film Festival (DFF) in 2011. Since 2009, Julien has also been involved in an earthen house building adventure in the hills above Sri Thanu village where Agama is headquartered. Julien has experienced the transformational power of the Yoga system first-hand and wishes to share this treasure with others. He has informed his own background in traditional yoga with intense study of numerous experts and rare sources, as well as his own deep and committed practice. Julien has been teaching in Europe and Southeast Asia for the better part of the last decade, most notably at the Agama Yoga Thailand headquarters where he serves as a senior resident teacher. He is grateful for the inspiration, guidance, and support that he continues to receive from members of the Agama family. When off the island, he facilitates transformational workshops and yoga retreats around the globe, creating a sacred space for his practical knowledge and experiential wisdom to overflow onto others. 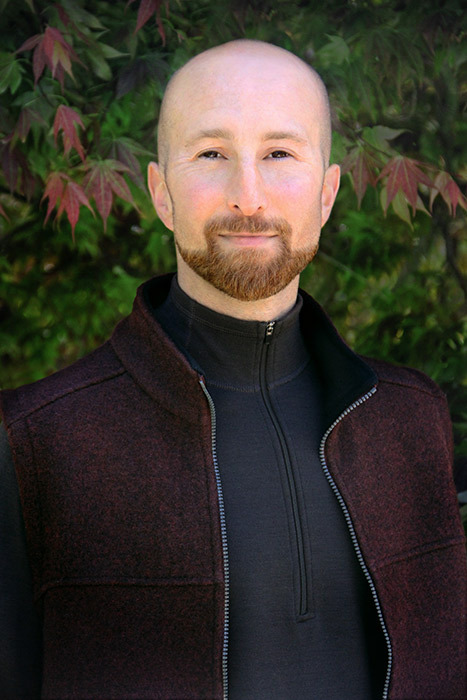 Nick Atlas is one of the world’s premier teachers of sleep & dream yoga, or yoga nidra. Having trained with a number of masters from a variety of healing traditions, he has been praised by his students as a "teacher's teacher" and for the playfulness, joy and light-heartedness he exudes and draws out in others. A native New Yorker and perennial traveler, Nick is an accomplished artist, musician, forthcoming author and graduate of Emory University in Atlanta. He is currently earning his Ph.D. in Psychology at the University of West Georgia, where he teaches undergraduates and conducts pioneering research on lucid dreaming. The founder of Evolutionary Education® and Yoga Sleep Therapy®, Nick facilitates multidimensional workshops and retreats internationally at studios, conferences, corporate events, festivals & resorts. Additionally, he has taught at the Omega Institute, Kripalu Center, and Canyon Ranch. Through the years he has served as a faculty assistant to some of the world's foremost spiritual teachers and, in particular, is proud to honor the work of his mentors Toni Bergins, Ken Cohen, Roger Jahnke, Jack Kornfield, Bobby McFerrin, Richard Miller, Elisa Novick, Stephen Spyrit, Swami Vivekananda Saraswati and Paulie Zink. Nick is proud to share his knowledge, wisdom, unbelievable stories and vast experience with Asian Yoga Holidays, and looks forward to learning with you as you become your own master. Reinhard Gammenthaler was born 1953 in Switzerland. During the wild and adventurous years of his youth he undertook vast trips through Europe, Arabia, Asia, North- and South-America and Africa, in search for true happiness. His quest for the deeper meaning of life was amply rewarded when he started to practice Yoga in 1979 and got in contact with his Guru Swami Dhirendra Brahmachari, an accomplished Hatha-Yogi of highest caliber, by whom he was initiated into the Tradition (Parampara) of authentic Kundalini-Yoga. He transformed into an ardent devotee of the great Shakti and spent long periods in the remote foothills of the Himalayas in the Indian part of Kashmir. There he underwent a rigorous Sadhana under the auspices of his Master, who died 1994 in a plane crash. His Guru had admonished him many times not to become a Yoga-Teacher, but a real Yogi, and so he started to teach only in the year 2002 and founded a School for traditional Hatha- or Kundalini-Yoga in his hometown Berne (Switzerland), to introduce other seekers into the intricate secrets of inner energies. Reinhard has since brought the rare teachings of authentic Hatha-Yoga to many practitioner in Switzerland and abroad and has been invited to teach workshops in many countries around the world.